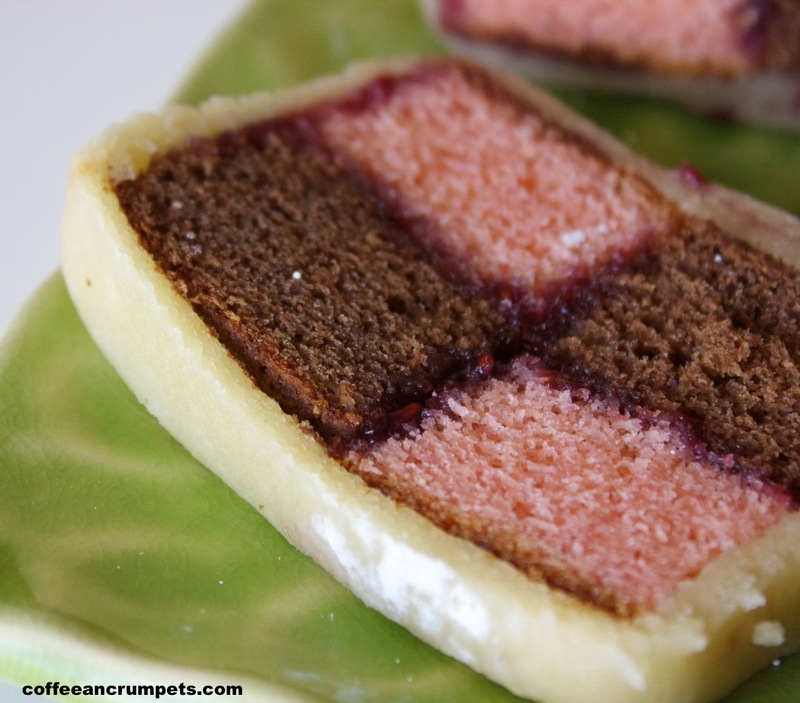 This was my first challenge with the exciting Daring Kitchen and I was so thrilled to find that the Baker’s Challege was the Battenberg cake, in honour of the Queen’s Jubilee. I have been wanting to make this cake for years. I often like to read cookbooks just for the sake of reading them. Some of my favourites are the cookbooks from England my mum used to have. I always come across this cake and am always intrigued by it’s chequered pattern. Funny thing, I never had a Battenberg the entire time I lived in England. My parents weren’t big packaged cake eaters and ones they did buy were because I insisted, usually a Victoria Sandwich or Mr Kipling’s jam tarts. I don’t remember seeing Battenbergs at any cake shop or bakery. There is a story behind the whole Battenberg cake; that it was made in honour of Queen Victoria’s granddaughter’s wedding to a Prince Battenberg. This is the most well known story but chances of it being true are quite slim as well as the fact that the coloured four chequered cake represents the four Battenberg princes. Whatever the story, the cake is beautiful to look at and incredibly tasty with the marzipan covering. 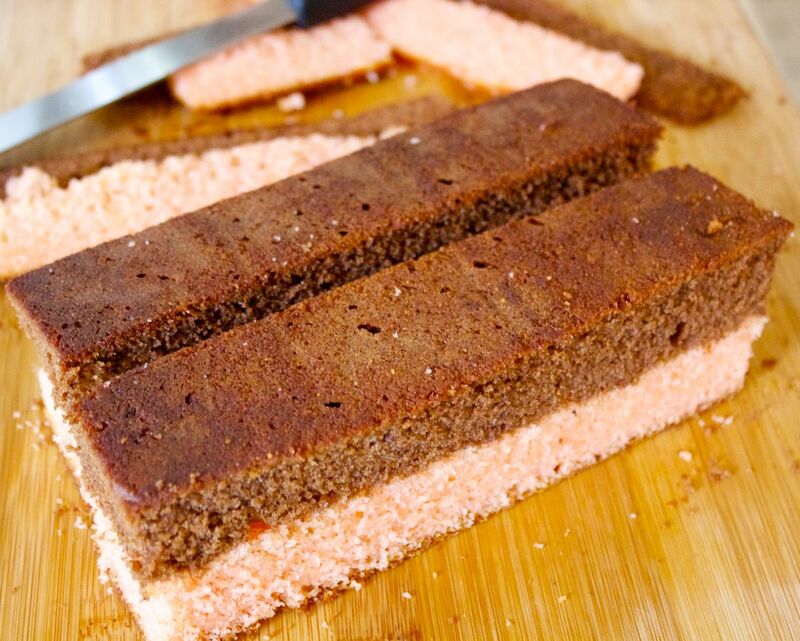 The marzipan adds that extra nutty flavour to enhance the otherwise plain sponge. 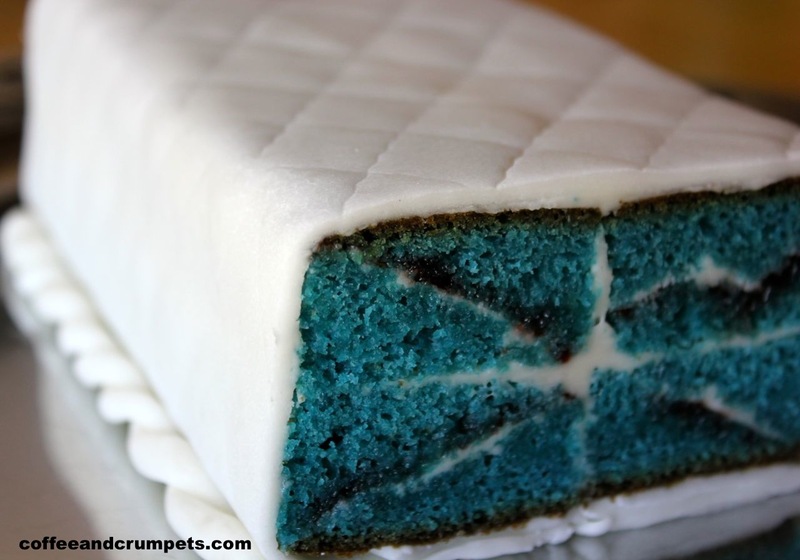 I wanted to make a Jubilee cake; something ablaze with the Union Jack or even just red, white and blue, and when this challenge was announced, I came across a very unique battenberg; the Union Jack battenberg. I knew I had to make it. It was a bit fiddly and time consuming but it was so worth the end result. I chose to cover this one with white fondant instead of marzipan. Since I like traditional things, I decided to make a plain battenberg also, with plain vanilla sponge and chocolate sponge. These flavours went wonderfully together and with the addition of the marzipan covering, the overall taste was buttery and nutty. You could use fondant or modelling chocolate to cover the cakes, but I think if you are using plain sponges, then the nutty marzipan adds the most flavour. 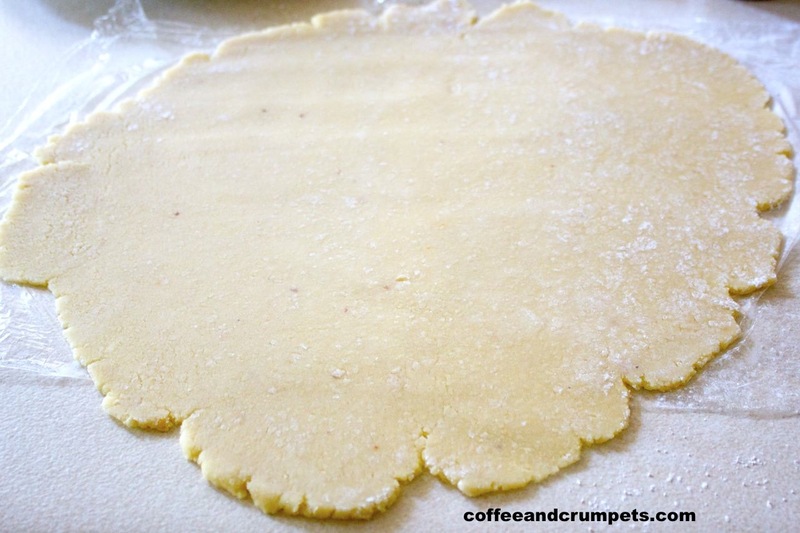 Prepare an 8″ square tin with parchment paper. 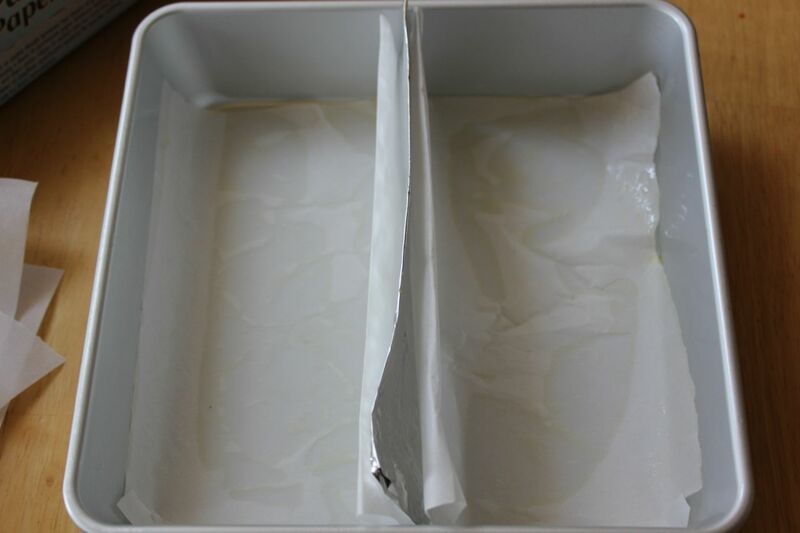 Grease and line the tin with parchment paper making a “wall” to divide the pan in half. 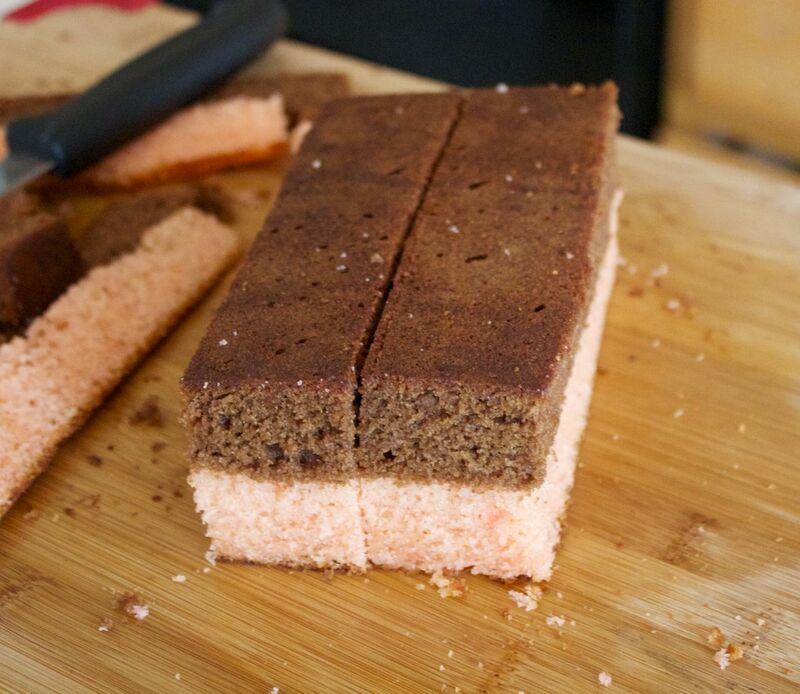 We want to bake the two different cake batters at the same time. Gradually, add the flour and fold in. Add the milk if the batter seems to stiff. You need a dropping consistency. Divide the batter in half and add a drop of red food colouring in one half to dye pink. In the other half, mix in the cocoa powder. 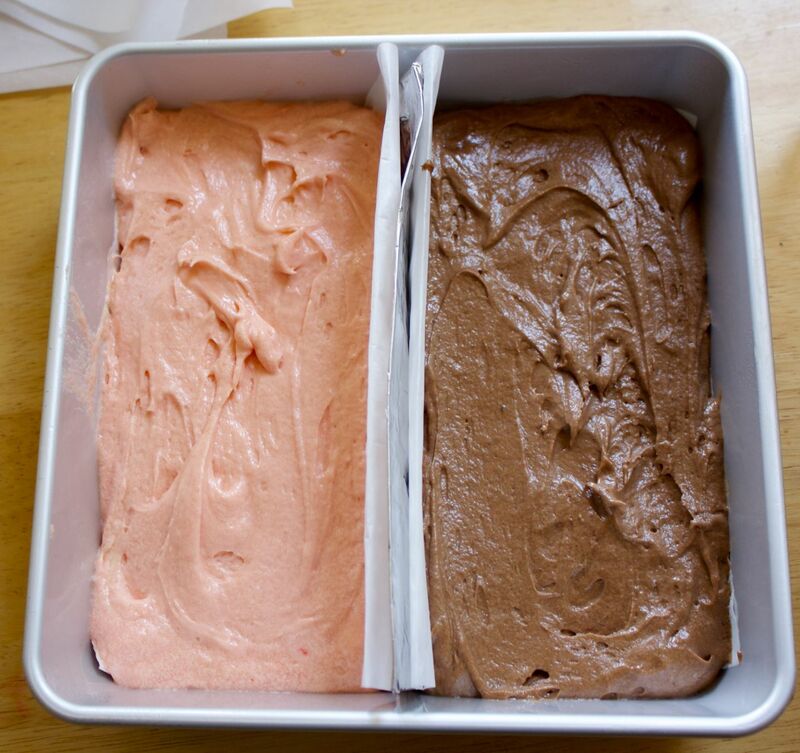 Transfer the batters to the cake tin, pink in one half, cocoa in the other. Bake for 40/45 minutes, or till well risen and firm to touch. Cool in tin for a few minutes and then turn out on wire rack and cool completely. Once the cakes are cold, trim them to equal size and cut each half lengthways. Dust a counter/surface with powdered sugar and roll out the marzipan/almond paste to a 30cm/ 12″ square. Place one strip of the cake on the almond paste so that it lines up against the edge of the marzipan. Brush the side with jam and lay an alternate colour strip next to it. Brush the top with jam and lay the other two remaining strip on top, alternating the colour and brushing sides with jam. Coat the top and sides with jam. Bring the marzipan up and over the cake to cover it. Press the marzipan firmly to the cake, then seal and trim the joint. Place the cake seam side down an trim both ends. Can make a decorative design on top or crimp the top edges. Sift icing sugar into a bowl with the superfine sugar and the ground almonds. Add the liquids to make a stiff dough. Form into a ball and knead lightly. Roll out on parchment/ plastic wrap if needed. Dust counter surface liberally with powdered sugar to prevent sticking. You don’t have to make your own almond paste/marzipan. Many places you can buy ready made almond paste. Here in the US, Whole Foods carries ready to roll almond paste. So, you may be asking if it’s worth all the trouble to make this cake? It’s a conversation piece that’s for sure and it does taste good, but I think if you are going to make it, then it should be made with exciting flavours and colours to get the maximum “wow” effect. It’s a gorgeous cake and it is worth the time to see the result. I really had a fun time with the Union Jack Battenberg and if you are interested in the recipe you can find it here. 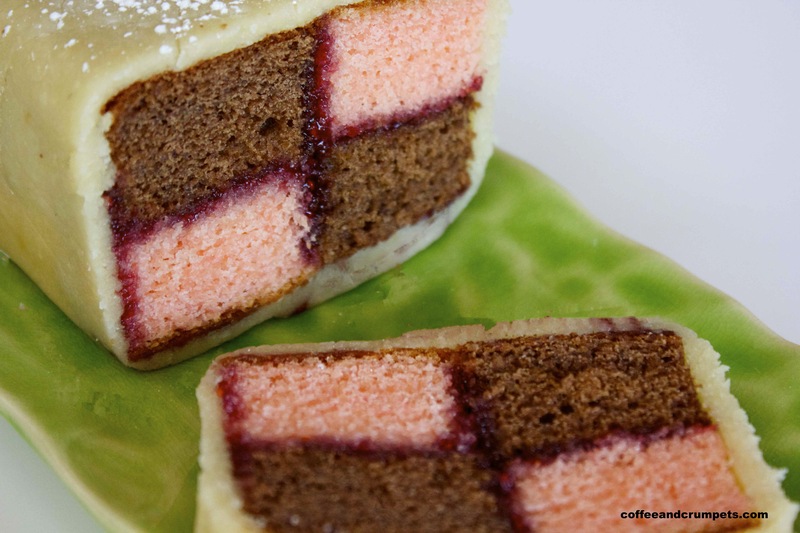 Have you all had a Battenberg before and if so, which one is your favourite? Wow, what a cake! I love the Union Jack! That looks fantastic. You really are a daring baker! I’m think I’m on my way to become a fantastic cake decorator, yes? Thank you Beth and your cake looked awesome too! An interactive cake, I love it! Both of your cakes are beautiful, but the Union Jack is just amazing! Such a smart idea and you executed it perfectly – great job! Thank you very much! I loved how the Union Jack one turned out. Your creativity and skill knows no bounds! Thank you very much! I had a good time working on the cakes. Nazneen, I’m seriously blown away. I have no idea how you have achieved such an impressive result, but the cake looks extraordinary! AS if it was made by a professional baker. It is also very appetising. Congratulations! Thank you for such wonderful compliments Sissi! I enjoy baking so that makes it a lot easier. Both of your cakes were fantastic and had to taste as good as they looked. Thank you Karen! They were pretty good. Thank you Nami for the kind words. I enjoy baking and so take my time with them. Both of your cakes are gorgeous! 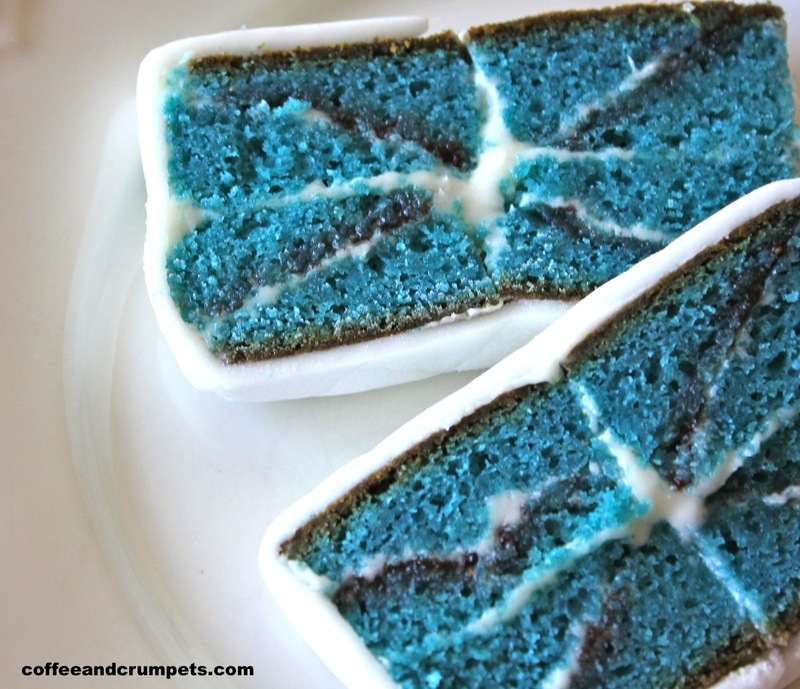 I’d have to try that Union Jack cake, it looks intriguing. Great job! Thank you! The Union Jack one is my favourite. It was tricky but I loved how it turned out. Thanks Lorraine. I loved your Mondrian one too but I don’t think I’d have the patience you did! loving the union jack version! Thank you Marilyne! When I saw this cake, I knew I had to make it. Thanks for stopping by! 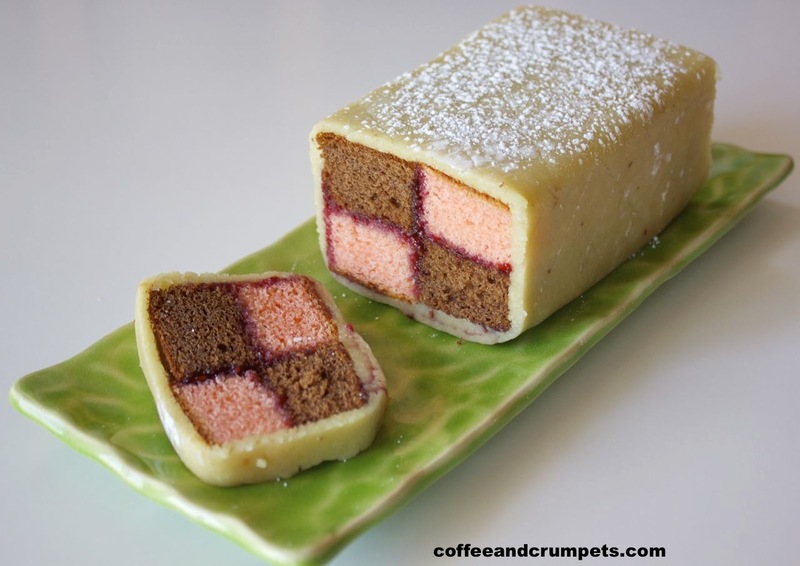 What a beautiful looking battenburg cake. You’ve done really well because I can imagine these must be a tad challenging. Love the blue one – how gorgeous. Thank you Charlie! They were a bit fiddly, especially the Union Jack one but it was worth the hard work. I am happy with the way they turned out. Thank you! Seeing your beautiful creations on your site, it means a lot 🙂 Thanks for stopping by! Thank Charles! I don’t remember Mr Kipling’s Battenberg. I ate the jam tarts like they were going out of style though! Well, packaged cakes aren’t that great though are they? This was quite good and I didn’t do anything fancy. Wow! !You guys are baking genius. I am a total nutcase when it comes to baking – well, eyeballing measurements are not the best way to a baker’s oven. But this has really intrigues me…..especially the multi layered cake.Love it. PS: Inspired by you, I made a frittata the other night. Will post about it soon. Thanks Minnie. I enjoy baking but man, does it make me fat! I look forward to your frittata! Thank you Thank you! I thought you’d get a kick out of the Union Jack cake. Goes to show that not all new fangled things last..the classics, they survive.